If Jerry Seinfeld and I were to ever hang out I wonder what we would talk about more? our mutual love for New York or our shared love of cereal? While I am sure pondering that question keeps Jerry up late at night, in the meantime I have a new cereal to try. 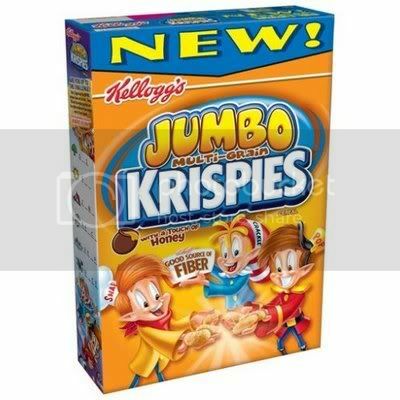 Jumbo Multi-Grain Krispies are the big bad cousin of Rice Krispies. Bad being the prime word. These Krispies are much bigger then a normal Krispie but smaller then a Corn Pop. The Krispies have a light honey flavor according to the box. Texture wise they are just weird. 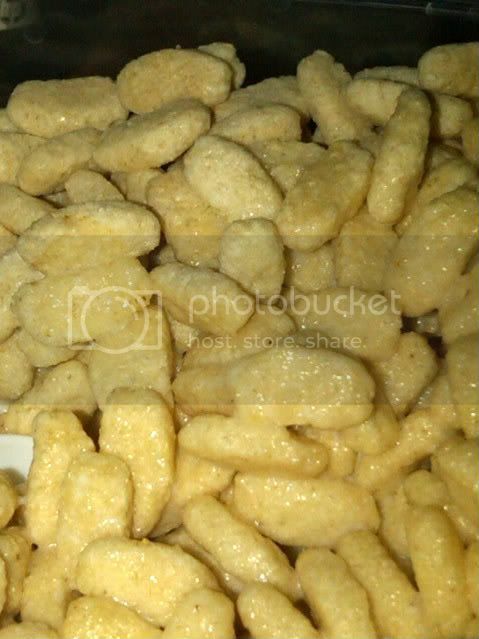 They are like cereal versions of Cheesy Poofs. If you eat them dry the texture is airy on the outside, yet weirdly powdery on the inside. Once they have been in milk, they get soggy fast but some of the 'dust' remains. It is a strange feeling. Flavor wise, much like how the texture changed in or out of milk so does the taste. Eaten dry straight from the box the taste is sort of like a completely sub-par generic brand cheese puff. It's kinda cheesy, kinda peanut buttery and then the whole thing is covered in a sugar glaze. In milk they go from zero to soggy in under five minutes. I like soggy cereal so if I liked these Krispies that would be a selling point for me. The thing is that the milk takes an already not great things to new lows. The flavor changes, this is about the only thing that improves. The flavor loses some of that cheesy, peanut butteryness and the only thing I could think to compare it to is Capt Crunch (thankfully without the mouth shredding sharp edges) The faux honey flavor because the main taste and there's a hit of an oaty aftertaste. In terms of texture if you have ever dreamed of eating soggy Styrofoam your day has come. You can kind of see how in the picture the pieces start to "glue" together into one big, starchy ball. Snap, Krackle and Pop really need to whip me up a batch of proper Rice Krispies treats to make this up to me. do they taste like corn pops? Corn Pops are awesome, this... All I am saying is I wish I could send the Kebler Elves over to rough up Snap, Crackle and Pop. I noticed you too reviewed this cereal that I just came across the other day. I know a lot of people look at the texture and appearance and all that, but if you are also interested, I wrote about them from a nutritionists perspective. I dissected these little bad boys to really reflect their health value and help people become more aware of what they are eating. I LOVE this cereal. I love the taste and its healthy. The ingredients are basic, unlike the long list of fake crap listed on other boxes. Make your own opinion and try them your self, I eating a bowl..or two now. I tried I just could not get through the box. I ended up giving it to my Brother- and he loved them.